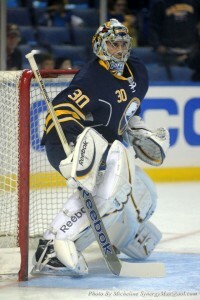 Buffalo Sabres: Jhonas Enroth or Michal Neuvirth? One of the hardest things for teams in the National Hockey League to do is to find and secure a goaltender that could man the pipes for your franchise for years. It is a comforting feeling as a fan of a team to know exactly who is going to be in net night in and night out. For others, not so much. The Buffalo Sabres find themselves in a bit of a dilemma heading into the 2014-15 season, when considering who is going to take a majority of the starts for them. For the first time in nearly a decade the Sabres, in my mind, are heading into the season without a bonafide number one. They were lucky to be able to pencil in Ryan Miller’s name in the starting lineup close to 60+ times a season during that span. Well times have changed and Miller is no longer a part of the Sabres plans. As we all know he was shipped off at the deadline to St. Louis for most notably Chris Stewart and Jaroslav Halak. Halak who suited up once but never stepped out on the ice for the Sabres, was traded away to Washington in a deal for Michal Neuvirth. 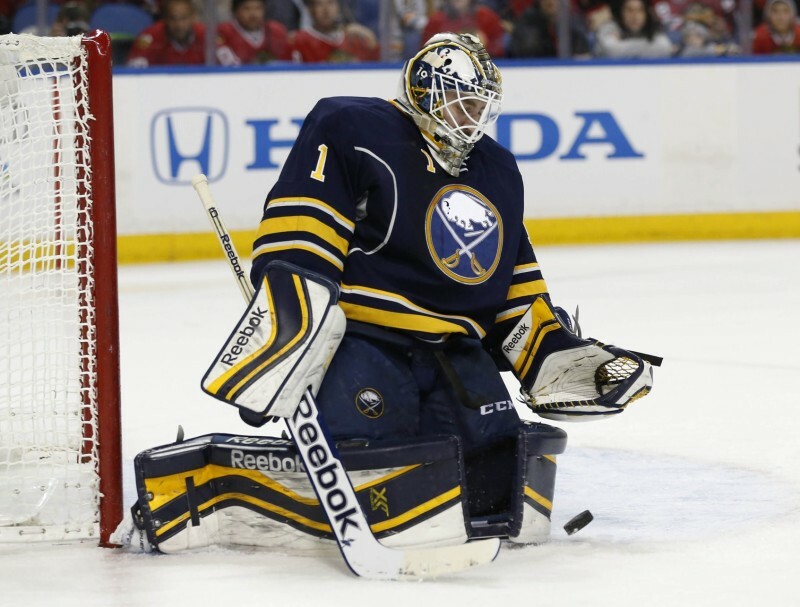 For years it seemed that the heir apparent to Miller was going to be Jhonas Enroth. With the acquisition of a goalie last season, it is hard to tell what the plan is moving forward. Decisions are made by management for the best interest of the franchise whether we want to believe that or not. Trying to figure out who gives them the best chance to win is something they will have to figure out before the season starts. After missing the playoffs for three straight years, the Sabres were back in the postseason following the cancelled season of 2004-05. With questions surrounding the goalie position with Martin Biron and an young unproven Ryan Miller, the Sabres selected Enroth in the second round of the 2006 entry draft. Miller took off which eventually led to the departure of Biron and the promotion of Enroth. There always seemed to be speculation around Ryan Miller as he neared the end of his contract. Would he re-sign with the Sabres or would he decide to take his talents elsewhere in hopes of winning the Stanley Cup in a different city? The decision was made for him last season with Enroth waiting in the wing. In his career, Enroth has played in 81 NHL games over parts of five seasons with the Sabres. Last season he played in a career-high 28 games before getting injured near the conclusion of the season to be forgotten. His career-high in wins came back in 2010-11 when he recorded nine in 14 starts. One concern for Enroth is he hasn’t had to play a full starting goalie schedule since his days in the American Hockey League. He played in 41 games for the Portland Pirates before his full-time promotion as a backup for the Sabres. The most he has played in one season was 58 games but that was back in 2008-09 again for the Portland Pirates. The question would be if he can handle a full slate of games at the NHL level. After being selected in the second round in the 2006 NHL Entry Draft (12 spots before Enroth) by the Washington Capitals, Neuvirth was on the move at the trade deadline last season heading over to Buffalo. Neuvirth played in two games for the Sabres last season posting an 0-2-0 record. He is another situation when a goalie was selected to possibly take over for the franchise goalie. Much like Enroth, Neuvirth was drafted near the end of Olaf Kolzig’s career. The Capitals had plenty of time to develop Neuvirth with other goalies they had in the system, but they would find out what he was capable of as he took over in the 2010-11 season. He started in 48 games that season winning 27 of them. Neuvirth had to battle for a spot every season it seemed having to mix it up with other goalies to earn playing time. In his NHL career, Neuvirth has played in 134 games winning 59 of them. It is going to be an interesting training camp as there is no clear-cut favorite. It has been said that both will get the opportunity to take over, so even management isn’t sure. Despite what everyone in the world thinks about the Sabres gameplan heading into the season, they are going to go with the guy that gives them the best chance at winning. On the one hand you have a player that has been brought up through the system (although different from when he was drafted), going up against a goalie that has more experience. Luckily there are several preseason games before the season starts to sort this out.